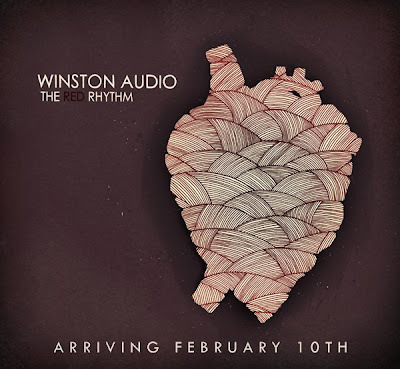 The Red Rhythm is the debut album from Atlanta, GA's Winston Audio. The album, out Feb. 10th, is a collection of eleven hard rock songs infused with indie spirit. From the opening track "On My Trail" it becomes apparent that these guys like to rock hard. The guitar work is an in-your-face tour de force. Despite being flangy and buzzy at times, the work is top shelf (next to the Johnnie Walker blue label). Along with the mid tempo southern-tinged rock riffs (think Dead Confederate) come a powerful set of vocals which sound like a tenuously controlled Chris Cornell. The grinding mid/down tempo numbers do get a bit tiresome. That's mostly because the band is so good when they rock out hard and fast ("Keeping It Down", "Smoke Signal"). The album ends with a couple of the more intriguing numbers. "Future Blues" is a stellar dark rumbling 'blues from a gun' number, while the closer "Troubles" is a haunting hard rock lullaby. The album does suffer from production issues. The audio quality at times can be fuzzy and murky, making one believe that the band's best may be lost in the process. Best tracks: "Future Blues", "Keeping It Down"